It was four, it could have been eight. From the first few minutes, Germany found acres of space between our defence and midfield, and began to exploit it – we didn’t react to it. Upson and Terry in particular were dragged all over the pitch, and Barry offered no protection whatsoever. As a result, Özil and Schweinsteiger dictated the game, and we were punished with good movement and finishing from the forwards. I picked out Özil as the danger man before the game but, whilst he was outstanding, it was 20 year old Müller who helped himself to two goals, an assist, and the MOTM award. Terry has followed Özil (presumably because Barry didn’t fancy dealing with him…! ), and left Upson one on one. Upson’s starting position is far too deep in my opinion. Since neither of them has thought to get to the flight of the ball and deal with it, it bounces and becomes a straight race between Klose and Upson. Upson used to be quick when he was a young defender, but after a series of injuries, and at 31, he has become slow and ponderous. 32 year old Klose is much sharper and hungrier, and he gets the better of Upson. It’s a typical Klose finish – very incisive – but absolutely hopeless defending from our centre backs. Suicidal positioning. 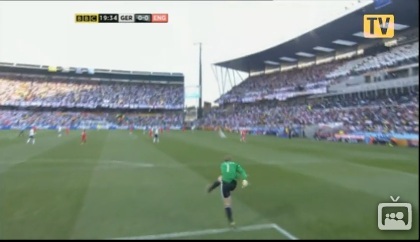 Unfortunately, what you can’t see on the clip is Matthew Upson’s helpful punt which kick-starts this move. 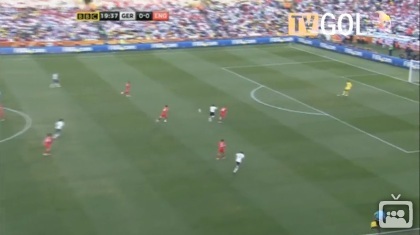 He was out on the left, with both Terry and James clearly calling for the ball, yet he decided to play it forward in the air, handing possession back to Germany. He did this at regular intervals throughout the match, very frustrating. The ball is picked up in deep midfield by Khedira. England stand off and give him time and space to look up. Notice Podolski at the top of the picture between Milner and Johnson. Khedira finds Müller, who instantly looks to move off the ball, seeing that a useful attack is unfolding. Our shape has totally gone to pieces. Özil is unmarked, Barry has pushed up on Khedira (why?! ), Cole isn’t tight enough to Müller, and Upson has one eye on Klose (out of shot). If we were defending this properly, Cole would have Klose, Gerrard would have Müller, Rooney would be pressing Khedira, and Barry would be stuck to Özil like glue. 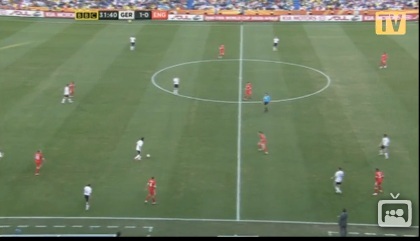 This would leave the rest of the back four in a position to defend the counter, with Johnson tight to Podolski. 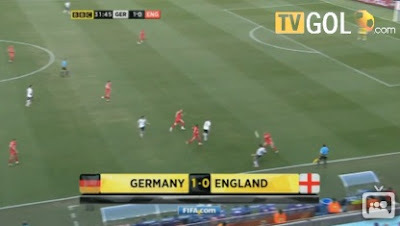 Özil takes a touch, has sucked John Terry out of position, and then looks to find Klose. Excellent running off the ball from Müller means that Klose can now dink the ball over Upson, who has been dragged right over to this side of the pitch (he was all over the place, all game), and left us totally exposed. Müller leaves Terry floundering, and should probably go for goal himself. The presence of Glen Johnson probably puts him off a bit but, luckily for him, he has another option. Milner hasn’t tracked Podolski (although he couldn’t have anticipated such a defensive shambles, so it’s hard to blame him) and, as a result, Podolski is left with just James to beat (albeit from a difficult angle). The shot goes underneath James, but it’s a fine finish. Another easily avoidable situation. 66 minutes gone, and we’re still only 2-1 down. Yet we stick all bar two players (including the goalkeeper!) forward for a free kick which we’re not even going to cross. Total lunacy. 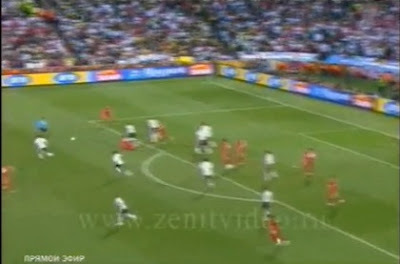 The free kick hammers off the wall, and a really sloppy heavy touch from Barry gives possession back to the Germans. They see a great opportunity to counter, as England have committed so many forward. 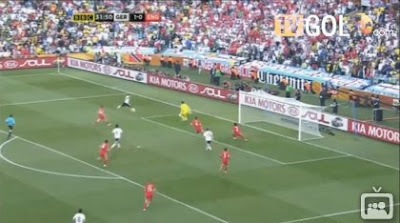 Schweinsteiger, nearest to the camera, is so alert and ready to bomb forward as the ball is played out from the back. Müller plays a nicely weighted pass to pick out Schweinsteiger, who has so much space to run into. Johnson, charging back, has a chance to take Schweinsteiger down. Surely worth taking a booking for in this kind of situation? Instead Schweinsteiger’s allowed to cut inside. It looks like he has delayed the pass too long, and is trying to force Müller to make a run inside Lampard. Müller holds his position, and does receive the ball, still with plenty to do. I must admit, I felt that James could have done more with this goal – the top goalkeepers would all fancy themselves to save it – but Müller gave him the eyes and made him think he was going to strike across goal. 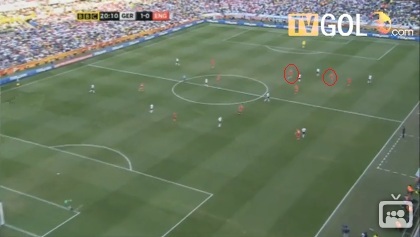 Teams are drilled on how to counter attack, and the Germans made this look absolutely textbook. One right, one left, and one through the centre – perfect movement and awareness. 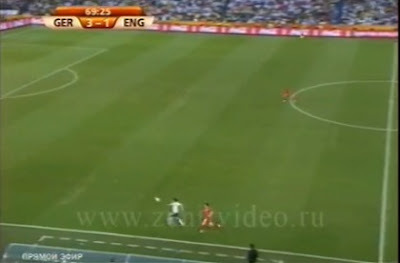 Another England attack breaks down, this time Joe Cole losing the ball with a feeble cross. 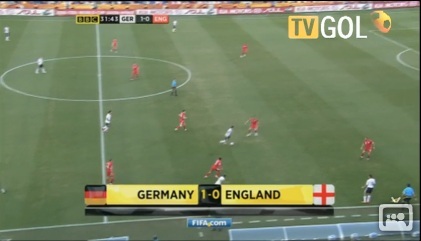 The Germans, having just had success with a counter, are so alive to the situation unfolding. Notice Özil, furthest up-field. Having seen Özil’s position in the previous shot, now look at Gareth Barry as the ball is played forward. He has 10 yards on Özil, and should some aggressiveness and go to meet the attacker. Worth having a look at the shot from above at this point. I have circled Upson, who is the other defender tracking back, but you can also see the eventual scorer, Müller, bombing forward in anticipation. As the ball bounces, Özil has made up a ridiculous amount of ground. Surely Barry should at least attempt to go shoulder to shoulder with him, or even take him down, safe in the knowledge that there is a man on the cover, and it will only be a yellow card. Instead, Barry watches as Özil ghosts past him, and has a clear run at goal. Brilliant run from Özil, and there’s more to come – he slows up and waits for the supporting run, knowing that both defenders are focused only on stopping him. He tempts the defender, before squaring to Müller, who now appears in shot. Müller is left with a simple finish. 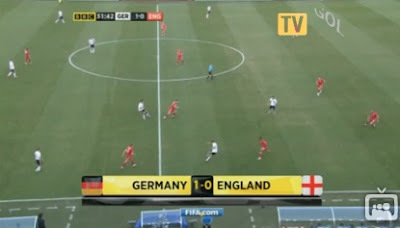 A wonderful German performance all in all, as England struggled to get to grips with their fluid formation. 4-4-2 was simply never going to work against this German side and, as I wrote before the game, it was crucial to stop Özil. In a standard 4-4-2, who would be responsible for that? Barry seemed the obvious choice, but clearly this would leave us short in other areas. That’s ignoring the fact that 4-4-2 doesn’t get the best out of any of our attacking players, as I mentioned in this article. This seemed the perfect time to use some version of 4-5-1 -not only would we be more defensively resolute (or at least be able to match up in midfield), but we’d also be able to Gerrard in his favoured role, off a front man. I always had Capello down as a tactical manager, so I’m disappointed that he didn’t make a change at half time. It was so clear that Germany, and particularly Özil, were finding useful pockets of space between the midfield and defence, and we were crying out for a dedicated holding player. Did he not watch the videos of the previous German performances?! Thanks for that, windy. But having played and watched a lot of pub football in my time I don't think you added a lot to what I saw when it happened! 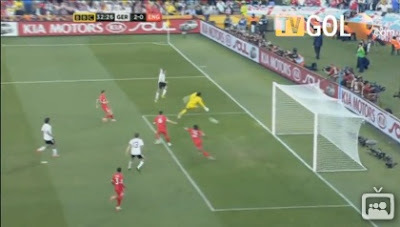 Your last picture of Podolski's goal shows Glen Johnson darting out of the goal mouth. I remember thinking at the time that if he'd stayed there he might (just might) have been able to block the shot. Was he trying to spring the offside trap in his own six-yard box?